I begin with a nod to https://elfkat.wordpress.com/ for shining light on this story. Woody Guthrie’s life waits for a dedicated ponder ( for the curious, linked – a biography from woodyguthrie.org below ) – this ponder focuses on Guthrie and Donald’s father Fred Trump. Post war America faced a critical affordable housing shortage for scores of returning military. Enter the Federal Housing Authority (FHA) with loans and subsides to construct urban apartment blocks. Fred Trump was one of the first housing “project” developers to profit from free flowing federal financing. Fred Trump dubbed his project Beach Haven. Not only did Trump Sr. begin construction before the project was approved, he rented to veterans six months before he had to start repaying federal loans – pocketing an estimated 1.7 million dollars. He also pocketed a 5% “developers fee” and knowingly borrowed 3.7 million over and above construction costs. In 1954 Fred Trump was investigated by a Senate Committee for “profiteering off of public contracts”. This is the legacy America’s Republican presidential front-runner Donald Trump is proud of? Between January 20 – February 20, 2016 Mercury, Venus, Saturn, Mars and Jupiter will be visible to the naked eye – five bright planets in a row, for the first time since December 2004. View larger. | Beginning around January 20 – through mid-February – you can see five bright planets at once in the predawn sky. Sleep is precious, so too is an opportunity to gaze at over half our planets in the theatre of pre-dawn’s quiet contemplation. Jupiter is first to rise in the early evening, followed by Mars after midnight, then Saturn, Venus and Mercury just before dawn. 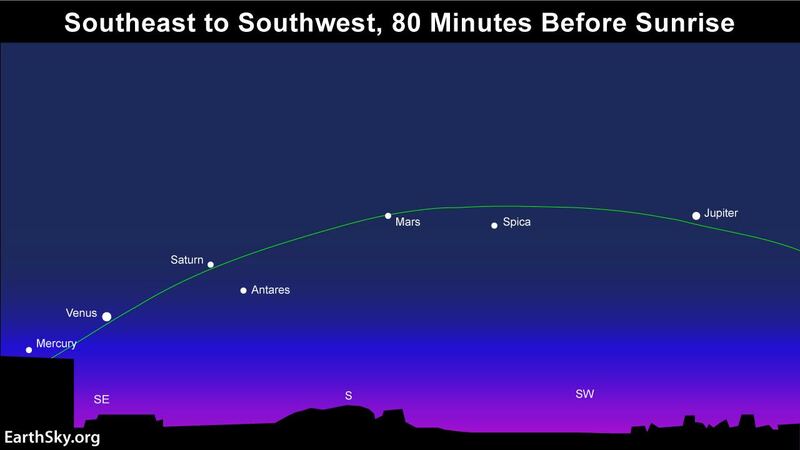 Those living in North America can click on the link below for precise rise and set time of moon, sun and planets depending on your location. The rest of you can use the next link. It requires a little patience and navigation to obtain longitude and latitude – but hey, you’ll learn your city’s coordinates along the way.